The Chippewa Valley Geek: Battlegame Book Series #1 of 20: Knights at War (Vol. 2) – Siege! 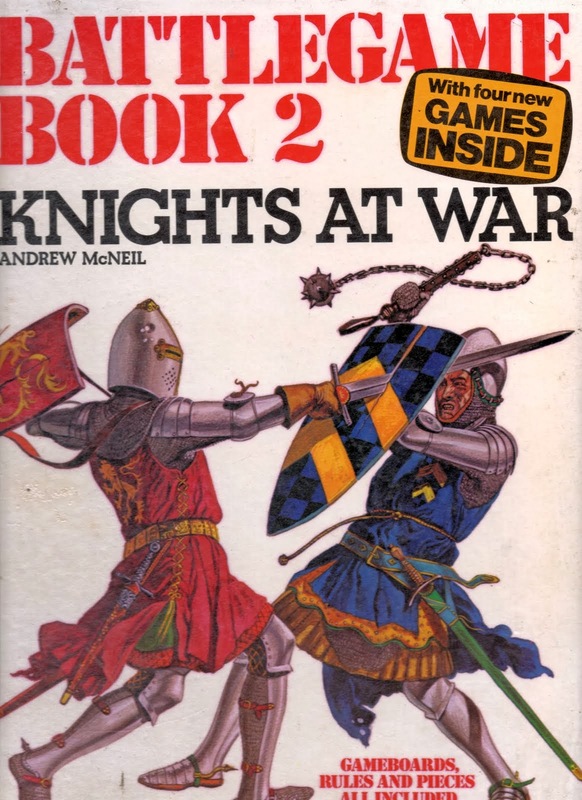 Battlegame Book Series #1 of 20: Knights at War (Vol. 2) – Siege! So there you have it. One year. Twenty playtests. This is going to be fun. Now the formats are pretty consistent here. These are big folio children's books, chock full of color pictures and information on the chosen topic, and each volume also happens to contain four complete wargames. To keep from damaging the original books more than necessary, I intend to use photocopies of the game piece pages whenever possible (though in some cases it would be appropriate to substitute minis of some sort too). I also intend to photocopy and laminate the rules for each game. The board to be used will be the original featured in each book. I pitched podcast roundtable guest Dastardly Donny on the concept this week and he was all for it. So having offered a shortlist of the games which I have om hand and had already photocopied gamepieces for, we decided to begin by playing an entry from Volume 2 “Knights at War” which is titled Siege! The game is pretty simple. There are two players, an attacker, the Earl d'Assault (me) and a defender, the Baron d'Efender (Donny). Each knight unit can move exactly one square per turn and the object for the attacker is to enter the board, breach the walls and capture the Baron in the donjon of the inner keep within 40 turns (supposedly reflecting the 40 day military service customarily due a feudal lord). The Earl has a nearly 2-1 number advantage for his attack, but there are those pesky walls, and of course the Baron has a limited supply of special weapons such as hot oil, rocks and Greek fire to be dumped on the heads of the attackers. Combat is basic to the point of being, well really basic. The attacking unit/player rolls a d6 and adds appropriate bonuses, then compares to the defender's value, which varies according to the strength and height of the wall and how it is defended. A success forces a defending knight to retreat and/or allows one knight to get on or through the wall. Recommended strategy involves cornering knights so they will be eliminated having no retreat path. The first thing we noticed was that the game seems to drive home the point that siege warfare is a slow podding affair. It takes 10 of the 40 turns just for the entire attacking force to even enter the board. Once there, the player must decide how best to divide his forces among the siege engines surrounding the castle walls to find points of entry into the keep. The attack bonus from each siege engine is equal to the number of knights required to activate it (see below). The heavier engines (the towers and the mine) have a much higher bonus for the attack, but then require 6-9 units to activate. The ladders or battering rams require less units but will require more rerolls to actually get “over the top”. The catapults do not make breach attempts themselves, but using a knight on one would support and add a +1 bonus to the assault of an adjacent siege engine. Donny rejiggers his defensive positions. It's worth noting that, in theory, each siege engine is able to function with just one unit operating it once if has been “activated” with an attack being made by full crew, which could encourage a rapid (so to speak) hit and run-type strategy with a swarm of knights running along the walls activating one engine after another to strike the wall in as many places as possible. That said though, the heaviest engines requiring the most knights to activate are the furthest from the attacker's map entry points, which would make that strategy either impossible or very difficult, based on the attrition required to keep at least one knight working each engine (until they enter the keep). This setup instead rewards a patient player who can move and amass a large contingent of knights on the far side of the board to hit the wall hard at a single point. Of course, it takes a lot of time off the clock to get over there, and it's much easier for the defender to re-organize his forces inside in the meantime to defend the threat. The other extreme strategy would be to hit the close ladders fast and hard out of the gate and just overwhelm the defenders at multiple points. This could require a single unit to breach up to three walls to get into the inner keep though, and would be the most combat-heavy, “smashmouth” option, as John Madden might say. I opted for a middle of the road option, trying to hit the wall at multiple points from the front and two sides. Right away we noticed some vagueness in the rules which may or may not have been intentional. First off, the combat resolution is different depending on whether the units are using a siege engine or fighting hand to hand inside or on the wall. The order of play is also rather vague, which can be troublesome especially when the wall gets breached and the chain of combat resolution needs to be determined. Do my knights already on the wall attack the defenders dumping the flaming pitch on my battering ram first? Or do I make the battering ram roll first with the nearby attacker bonus instead? For that matter, can the defensive weapons like the oil or Greek fire be used proactively in attacks onto the assaulting knights instead of just being used to add to the wall's defense? The rules seem to imply that they can, but offer no mechanic for resolution. That isn't "hand to hand" combat, but the only attack rolls made in an "assault" hinge on the rating of the siege engine. In any event, these games are amazing in being able to get the rules for each onto a single page, along with handy helpful strategy tips as well. That in and of itself is an achievement. While we were a little frustrated at the gray areas or disconnects we found as we went along, I suspect those may not be as much a problem for the (assumed) intended original audience of 10 year olds. who likely have less aversion to fudging and making stuff up as they go along. The other major factor/drawback we found is the game timer. The defender's victory condition is essentially to run out the clock, and with a 40 turn scenario, it can be pretty hard to make sure you are keeping accurate track of that progression. It would be far easier to keep on top of in a game with 10 or 12 turns for example, but with 40, I cannot say with confidence we did not ever forget to advance the timer, which directly affects the outcome in a big way. Even though it seems like forever when thought about, especially in the beginning when the Earl's forces are plodding slowly onto the mapboard, the time restraint does become a crunch and can be a race against time before the attacking knights are dropping into the inner sanctum. Lastly the other observation arising from the format itself was that, it was hard to get the board to lay flat. This may not have been as much an issue with minis, or if I had backed the paper cutouts with cardboard (as recommended in each book's instructions, but we had a lot of trouble adjusting the pieces that went sliding every time one of us bumped the page that wasn't flat. I still love the concept of all the game boards appearing in the book, but logistically, it made it tricky - this time around at least. The basics of the game made it relatively quick to pick up. That said, there are still peculiarities to the rules that made some less obvious strategies and best practices not really come out until part way through the game. I am not as enamored of siege warfare in general as Donny, but I did like the engine mechanics. The game map itself looks fun and engaging. Donny wanted to try it again to test a better understanding of the rules and strategy. I felt it was a bit of a grind and will be happy to move on to something more dynamic hopefully next time. We both thought the scenario was pretty favorable to the attacker, who should probably be able to earn the win by the deadline, barring horrible dice rolling along the way or Grant Fuhr defending the wall.